Peanut butter and jelly pancakes are the easiest way to prepare pancakes for a crowd. 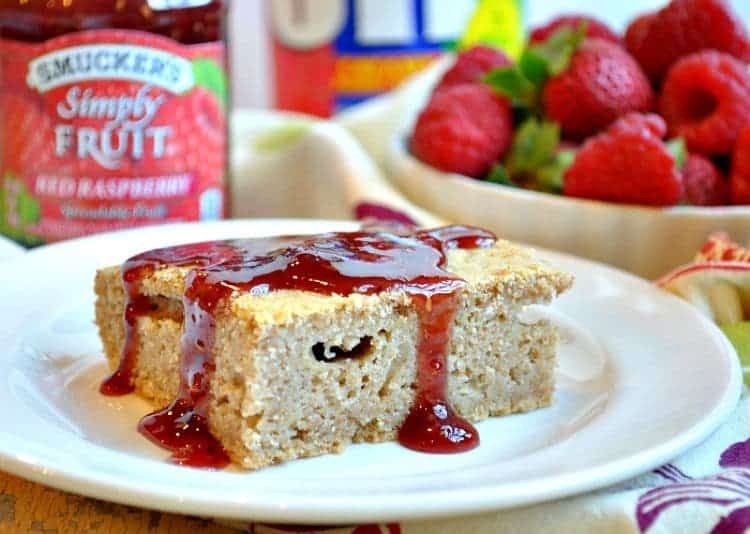 Peanut Butter and Jelly Baked Pancakes are the easiest way to prepare pancakes for a crowd (or for just a hungry family)! 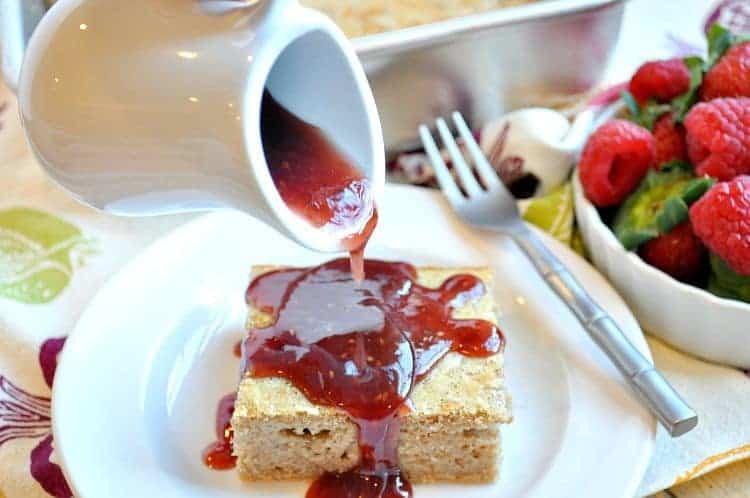 A nutritious whole grain peanut butter batter is baked in the oven, sliced into squares, and topped with raspberry jam syrup. These pancakes freeze well, so they are an easy make-ahead breakfast option for busy school days, as well as a special brunch treat on lazy weekends! 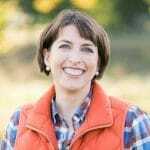 I am a member of the Mom It Forward Blogger Network, and today’s post is sponsored by Smucker’s. Thanks for supporting the brands that make The Seasoned Mom possible! This, my friends, is a match made in heaven! 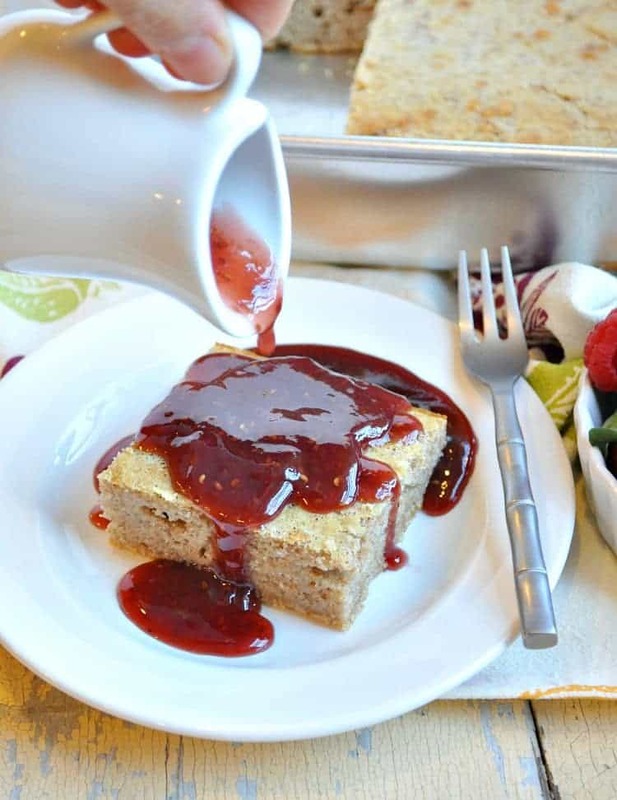 There’s just nothing better than the combination of peanut butter and jelly (or jam!). The classic sandwich is one that I was raised on, and it has now become a most-requested lunch for my boys as well. It’s comforting, it’s reliable, and it’s always delicious! So when I was preparing to send my oldest off to kindergarten this week (sniff, sniff), I knew that I better come up with a breakfast that would nourish him through his long days, but also one that would offer some comfort and familiarity as he embarked on this new adventure. Since the boys love pancakes and PB&J, why not combine the two? The peanut butter offers satisfying healthy fat and protein, while the whole grains in the pancake batter provide fiber, energy, and other important nutrients. This is a time-saving recipe because I don’t have to stand at the stove flipping pancakes. But you know what’s even cooler? 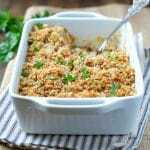 I can prepare the dish on a weekend, slice it, and freeze or refrigerate the individual squares for easy reheating during the week. 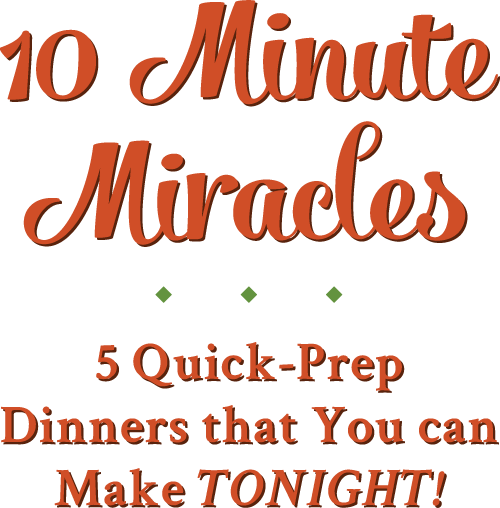 A few seconds in the microwave and a warm meal is ready! Win-win-win! Perhaps the sweetest part of this recipe, however, is the all-fruit raspberry jam on top (and it couldn’t be any easier)! 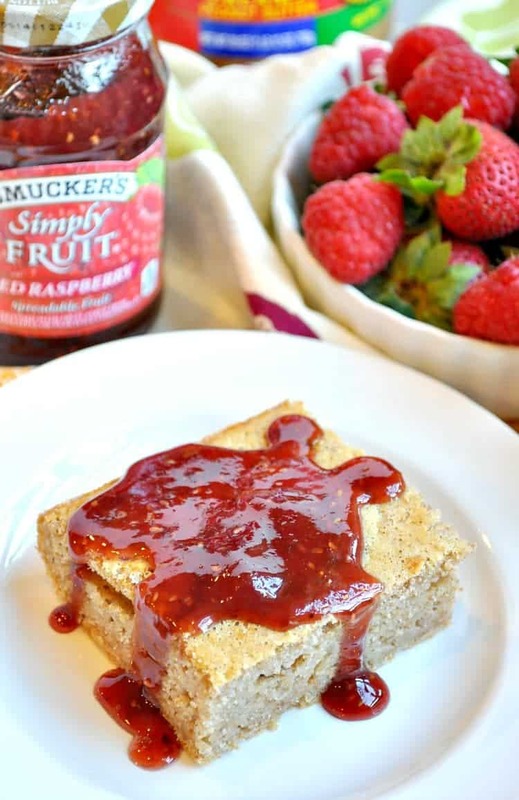 I’m so excited to be partnering with Smucker’s for a series of posts this year. 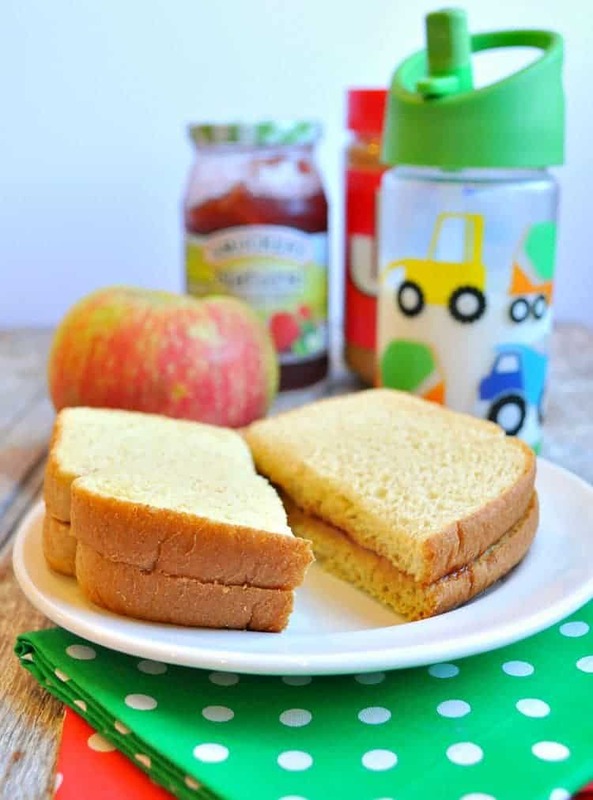 You can expect a couple more delicious peanut butter and jelly sandwiches in the coming weeks as we celebrate PB&J moments that really matter (like the first day of kindergarten)! 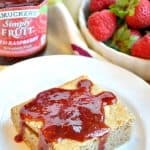 Smucker’s Fruit Spreads like the Simply Fruit Red Raspberry Spreadable Fruit in this recipe are my go-to, because I know that I can count on their authentic tastes and variety. For this particular “syrup,” I just microwaved the Simply Fruit for about 15 seconds so that it was smooth and pourable. The perfect sweet touch! Baked Pancakes With The Best Flavor Combo! The pancakes are a fun and different way to enjoy the classic flavor combination, but the original PB&J sandwich is a favorite for a reason! 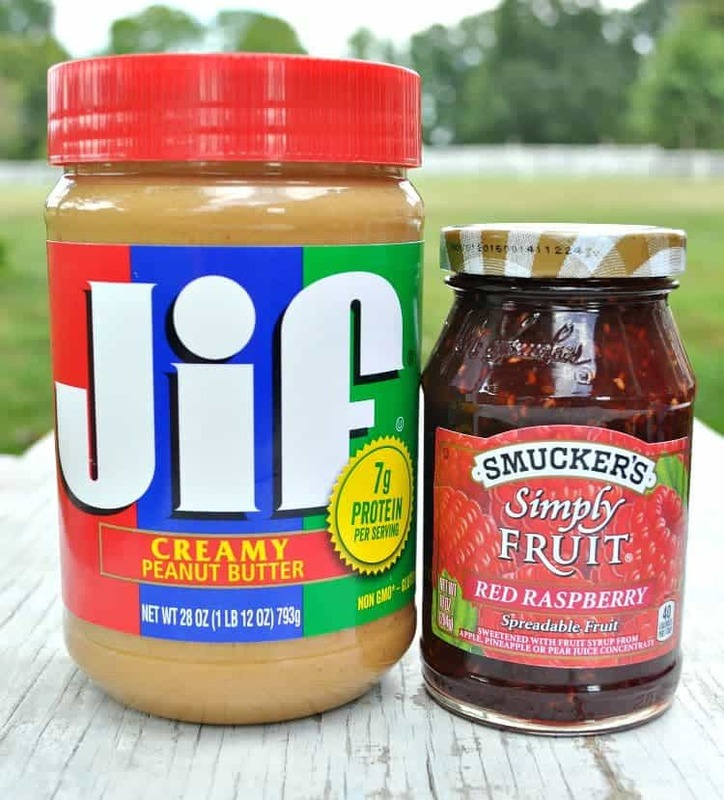 Before I get to the pancake recipe, let me walk you through my tried-and-true “recipe” for The Perfect Peanut Butter and Jelly Sandwich. 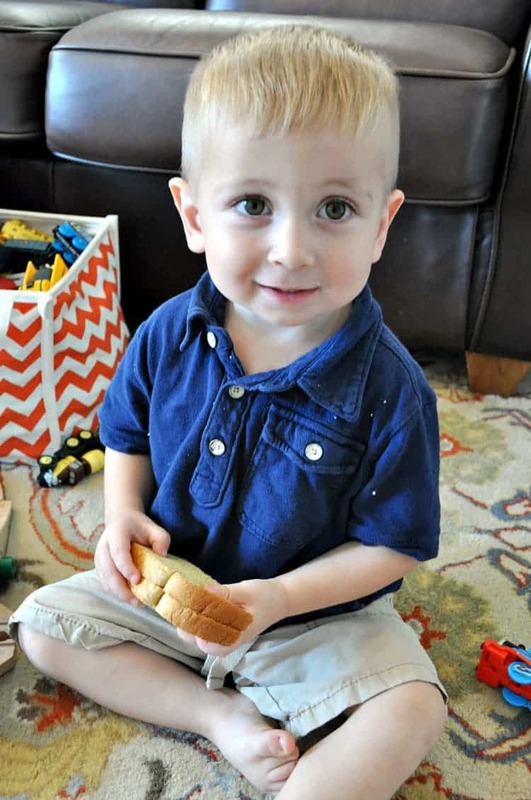 First, I start with two slices of whole wheat bread (my boys LOVE a whole wheat potato bread, but they’re open to just about any loaf I purchase), and I slather each piece with a layer of Jif Creamy Peanut Butter. and then cut in half and serve with milk and fruit. This is a very typical lunch in our house! When both of my older boys were off at school, I treated my youngest to a special treat: his favorite lunch picnic-style on the floor with his trains! 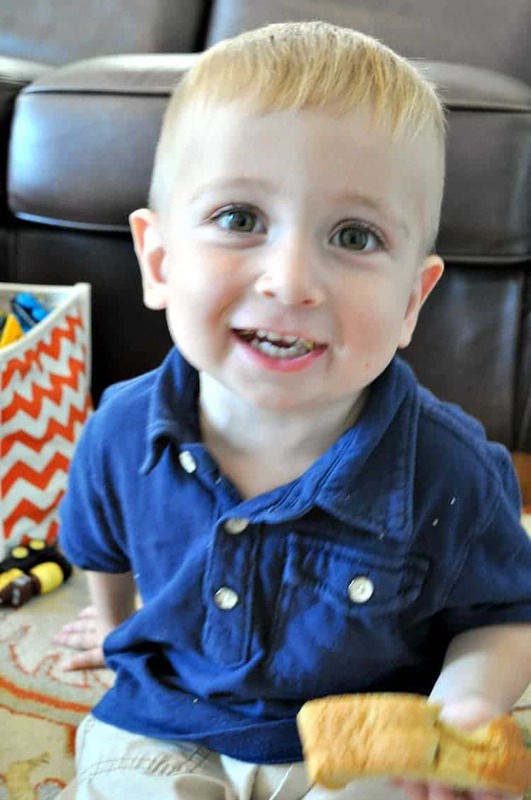 What more could a little guy ask for?! It’s special moments like these that I hope he remembers forever: a few minutes of quiet one-on-one time with Mom to savor a comforting meal and enjoy each other’s company! Whether they’re at breakfast with baked pancakes before the kids rush off to school, or during a quiet lull in the afternoon, my PB&J Moments with each of my boys are some that I will always cherish! 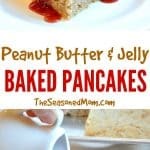 If you’ve tried these Peanut Butter and Jelly Baked Pancakes or any other recipe on The Seasoned Mom then don’t forget to rate the recipe and leave me a comment below! You can also follow me on Facebook, Twitter, Instagram and Pinterest to see what I’m getting up to. Beat eggs slightly. Add butter, milk, and peanut butter. Gently stir in dry ingredients. Whisk just until combined. The batter will probably still be lumpy, which is fine. Don’t overmix. 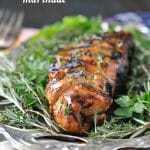 Bake in a greased square dish at 375°F (190°C) for approximately 40 minutes, or until center is cooked through. Allow to cool in pan for a few minutes before slicing. Just before serving, place jam in a microwave-safe bowl. Microwave on high for approximately 15-30 seconds, or until jam is melted. 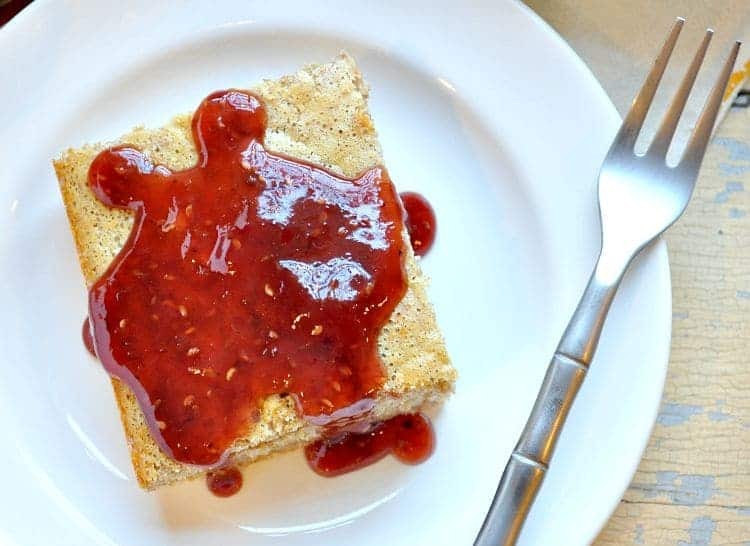 Drizzle with jam. Baked pancakes are my favorite! I love that I don’t have to stand over the stove and fail at flipping them. This pb&j version sounds fantastic, Blair! What a perfect breakfast! 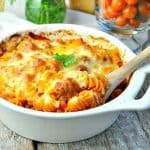 Such a genius recipe, Blair!! And such a time-saver too! 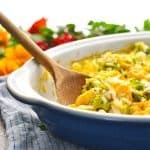 🙂 I bet this would be a major hit at my house–looks delicious! Pinned! Thanks, Anna!! Who can argue with peanut butter pancakes, right?! 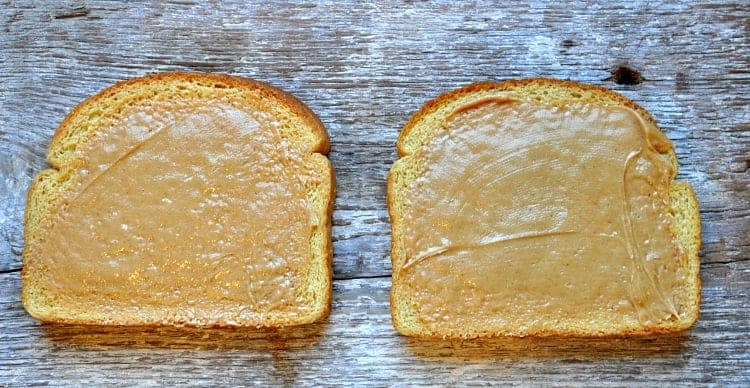 How can you go wrong with peanut butter and jelly? Using the combo for pancakes sounds perfect!